Haptics is the science of the sense of feel and touch. Haptic interfaces use forces, generally on the hands, to transmit information. 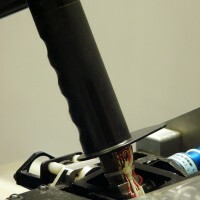 Forces on a control device typically lead to a direct influence from the haptic system on the control input, creating a situation of shared control. Cognition is not an isolated phenomenon, but an result from the interaction with the environment. Action and interaction are needed produce a valid cognitive environment.